Lewis Hamilton says he is excited about the prospect of a season-long fight between his Mercedes squad and rivals Ferrari after he claimed his third victory of the season in Bahrain. Hamilton led throughout but survived a late scare when both he and team-mate Nico Rosberg suffered a brake-by-wire problem to claim victory, ahead of Ferrari's Kimi Raikkonen. "I'm really happy with that," he said. "It doesn't matter who it's against - you always try to beat everyone. But it's great to have a fight with Ferrari as well as Nico. "Mercedes has been the best team on the grid for the last year or so but Ferrari are pushing us really hard now. It definitely wasn't an easy win. "It was close when I came out of the pits after the first stop and the battle behind me was intense. I had a bit of a slow stop which reduced my gap and when I was braking into T1 I saw them [Rosberg and Sebastian Vettel] right there in my mirrors! "From there I felt like I had it pretty much under control. I had to back off at the end with the traffic and the brakes but luckily for me the effect wasn't as great as for Nico." 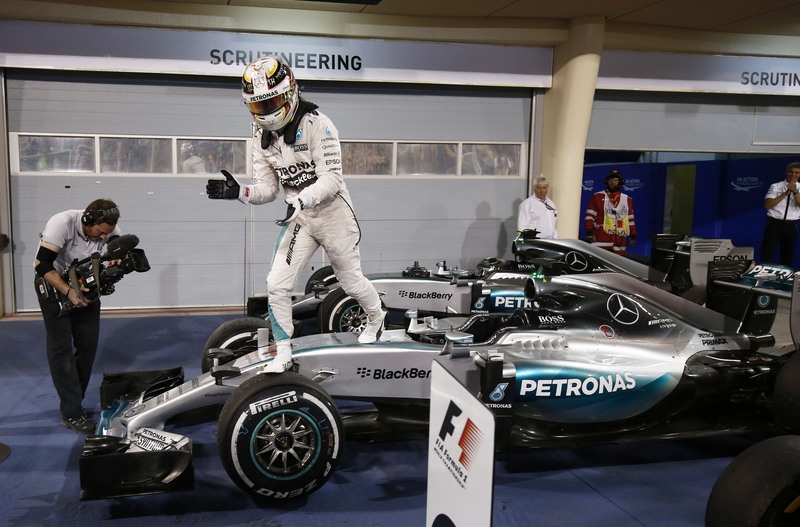 Hamilton's victory leaves him 27 points ahead of Rosberg, who placed third, in the championship.